Hydraulically-locked Work Supports differ from clamps and vises in that they do not actually exert force upon the workpiece. Rather, they are used to support the part being machined, offering resistance to any clamping forces acting counter to the direction of travel of the piston. 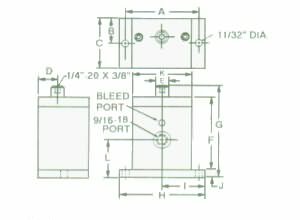 In a typical application, a large, thin casting is located on several tooling point pads for positioning. Work Supports will automatically adjust to support the delicate sections of the casting. When hydraulic pressure is applied, the floating pistons within the Work Support are locked in position and resist any downward movement exerted on the casting. After the casting is removed, the floating pistons return to their fully-raised position.